The Gajendra Peeth, the lower pradakshina, is a unique, captivating feature of Swaminarayan Akshardham and is an inspiring revival of an ancient architectural tradition. Ancient architectural treatises like Mayamtam, Shilpa Ratnakar, Diparnav and others prescribe a gajsthar (plinth of elephants) for palaces and mandirs. This tradition is found in the ancient Kailas Mandir of Ellora, which is 1300 years old and in the Mahabalipuram Mandir that is 1400 years old. Prior to the 12th century, many mandirs followed this tradition by having a gajsthar. The large gajsthar of the Swaminarayan Akshardham marks a bold return of this tradition. Akshardham’s unique revival of this tradition comes with a new inspirational, artistic innovation. Instead of the sequential replication as seen in old mandirs, it portrays inspiring incidents related to elephants – such as how elephants and humans share close relationships, how elephants were blessed by the divine and stories from the Panchtantra. 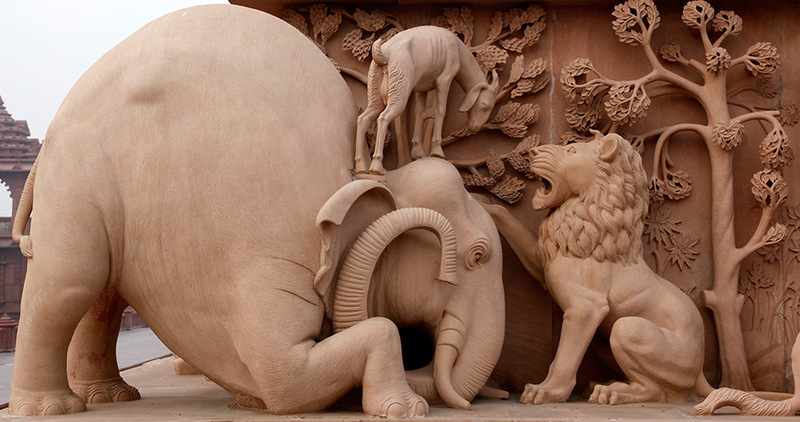 Below are some samples of these stories as carved in Swaminarayan Akshardham’s Gajendra Peeth. A lost goat in a dark jungle takes refuge in a lion’s footprint to save itself from being attacked by wild animals. When the lion arrives it is pacified and pleased to see the little goat’s faith in his footprint. He blesses her with protection and summons an elephant, placing the goat on the elephant's head to transport her safely and honourably to her home. The moral of this Panchtantra story is that even an ordinary soul is protected and attains greatness by taking refuge of the great. Once a king is pleased with a poet's skill and promises to reward him with gold equivalent to the weight of an elephant. But that creates a challenge - how can one weigh an elephant? A brilliant minister discovers the solution. An elephant is led into a boat. The depth to which the boat dips into the water is marked. Then the elephant is led out of the boat and the boat filled with gold till it dips to the same mark. This is the weight of gold equivalent to one elephant. The king is impressed with his minister’s intelligence – and they now know how to find the weight of an elephant. The Devtas and Danavs get together to churn the ocean for 'amrut' - the nectar of immortality. Using the serpent Vasuki as a rope and Mount Mandrachal as the churning-rod, they churned out 14 precious items from the ocean, each of which is claimed by either the Devtas or the Danavs. The seven-trunked white elephant, Airavat, is claimed by Lord Indra. Airavat is seen as a symbol of auspiciousness, wealth and power. Airavat is heralded as the king of the animal world and the vehicle of Indra, ruler of the heavens. Airavat is a white elephant with seven trunks, a naturally armoured body and divine immunity to fire and injuries. When Kunti, mother of the Pandavas, sees a reflection of Airavat in the miraculous floor of the palace of Indraprastha, she wishes to see and worship it in person. To fulfill his mother's wish, Bhima reaches the heavens, defeats the forces protecting the divine elephant and proudly brings Airavat from the heavens. Bhima creates a pathway of arrows between heaven and earth for the divine elephant's descent. This story from the Mahabharat aims to show that it is the children’s duty to fulfil their parents' wishes. "Let barking dogs bark, the elephant does not stop to listen or look back, nor change its path or gait." Entry: Free and open to all.. Shoes are permitted on this level. Please retrieve your footwear from the shoe-house before enjoying the Gajendra Peeth. Please do not touch the carvings.